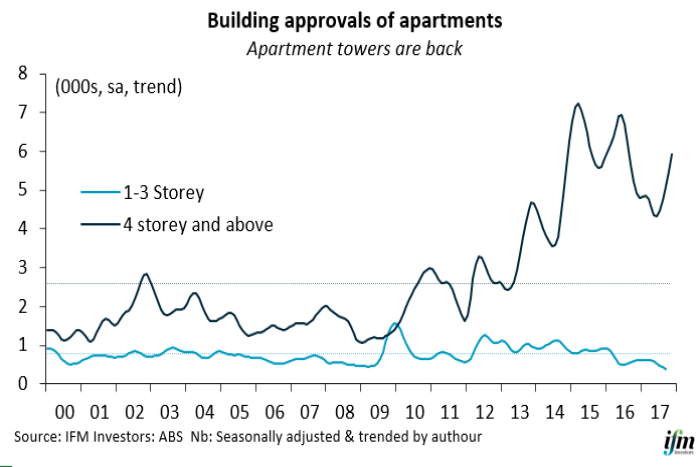 The Australian residential building boom continues to defy expectations of a downturn, led by a surge in approvals for apartments. The latest data from the Australian Bureau of Statistics revealed a 30.6 per cent rise in apartment approvals in November, while house approvals fell 2 per cent. 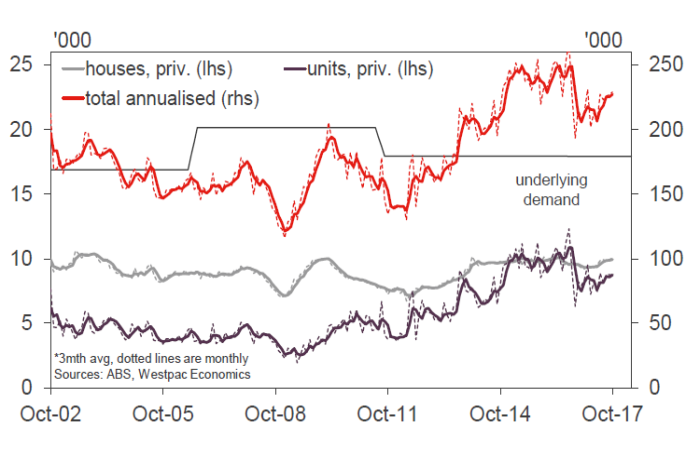 Overall dwelling approvals rose 11.7 per cent during the month, seasonally-adjusted, smashing economists’ expectations. Those surveyed by Reuters were expecting a 1 per cent fall, with even the most bullish forecast from Laminar Capital tipping a rise of just 3 per cent. A total of 21,055 dwellings were approved in the month, the third highest result on record. The estimated value of approvals rose 9.4 per cent. 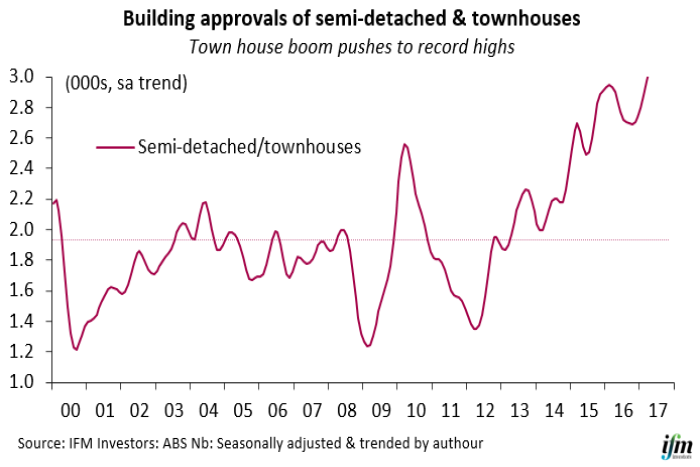 Looking at the trend, total approvals have been on the rise for ten months. House approvals fell for the first time in eight months, slipping 0.1 per cent. The outperformance of the apartment sector reflects buyer preferences, according to IFM Investors chief economist Alex Joiner. “It seems the trend towards living in a more desirable location continues to win out over the traditional house on its own block,” he said. As some first homebuyers give up on the dream of a backyard, Mr Joiner said some are looking to tower blocks in the CBD and inner suburbs. Others are buying townhouses slightly further out. Across the states and territories, Victoria was the clear leader, continuing its upward trajectory. Total dwelling approvals rose 5.6 per cent in the state in November in trend-terms, marking six months of gains. “The number of approvals in Victoria over November was more than double the 20-year average,” said St George senior economist Janu Chan. We would expect that to be a one-off spike because it was so huge, even though there is probably quite strong demand in Victoria because population growth is so strong. JP Morgan economist Tom Kennedy noted the surge in higher-density approvals was primarily concentrated in Melbourne. “This likely owes to the approval of a single very large project, and clearly leaves the flow of approvals in unsustainable territory,” he wrote. Elsewhere, approvals in New South Wales fell for the third month, down 0.9 per cent in trend terms, while approvals in the ACT slumped, down nearly 22 per cent. Can the building boom continue? After November’s surprise surge, Alex Joiner expects a pullback in approvals of medium-density dwellings. “From there I would suggest that approvals will continue to decline modestly in trend terms as interest rates remain unchanged,” he said. “We would expect a gradual decline in approvals given that, nationally, house prices are starting to ease, auction clearance rates are off their highs and also the measures by APRA on lending,” added Janu Chan. In the meantime, more buildings going up could mean good news for those looking to break into the market. “Additions to the supply of property should continue to take price pressure off the market,” said Mr Joiner. St George expects prices to continue to ease but is not forecasting a crash in the near term. “The increase in housing supply through apartments should, over time, keep prices under pressure,” said Janu Chan. With the growth rate rising and the demand for better managed buildings becomes paramount. New buildings will yell for a software their owners and tenants want. Stratafy add to the value of new buildings & focus’s on the customers from the very beginning from moving in through to ongoing engagement.